Hampshire Search and Rescue (HANTSAR) is a voluntary organisation (charity no. 1174085). We provide round the clock cover to assist the police and other agencies to search for vulnerable missing persons. Searches may be carried out in urban areas, including door to door enquiries, searches of car parks or recreation grounds etc., in the countryside, on open land or in wooded areas. We may be asked to search beaches or riverbanks in conjunction with the Coastguard or Environment Agency. We are available any time of day, whatever the weather. HANTSAR is one of many county based Lowland Search and Rescue units which exist countrywide. Like our sister organisations we are affiliated to the Association of Lowland Search and Rescue who are responsible for coordinating the various groups and setting the standards to which we must adhere. 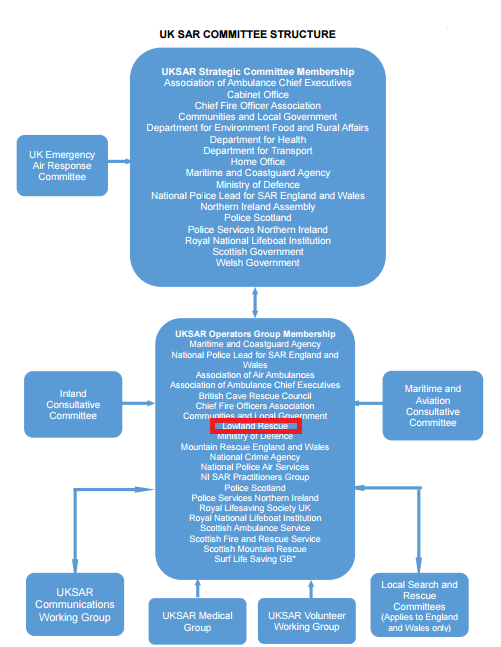 Lowland Rescue is part of the UK SAR Operators Group which is part of the UK SAR COMMITTEE STRUCTURE which advises government on SAR issues. In addition to searches for vulnerable missing persons we may occasionally be called out to search for other items, such as a piece of clothing, a weapon or some other piece of evidence or even a missing vehicle or a downed aircraft. We are also available to help in cases of civil emergency or natural disaster. All our operational members are professionally trained to the standard required by the police and other search and rescue agencies. This includes qualifications in search techniques, first aid, map reading, radio operation, search planning and management etc. We are equipped and insured for any operation we take part in. This training requires a high level of commitment from our volunteers who are all subject to an enhanced DBS check. HANTSAR is totally dependent on donations and membership subscriptions for its funding. As a team we have various fundraising events planned for the coming months. However, we are in need of donations of both cash and equipment. We are always looking for prospective members both as searchers and for a number of important support roles. If you feel that you have something to offer and you are at least 18 years old and are able to spare some time on a regular basis for training and operations why not give us a call? If you have any questions or would like to find out more about us, please contact us.